The months of May and June are typically reserved for high school graduations, college graduations, as well as, graduation parties. Graduation holds different emotions for both parents and the graduate. But most of all, it's an exciting time for all. When I finished college and received my degree I felt an overwhelming sense of accomplishment, pride and inspiration. I was inspired that I could make a difference in, and contribution to, the world -in my own way. One of those ways is through my inspiring jewelry designs. I've designed some beautiful graduation bracelets over the years and each one is a symbol of hard work, dedication and accomplishment. INSPIRE the graduate with this original and unique graduation jewelry gift that will become a treasured keepsake to be worn for years to come. 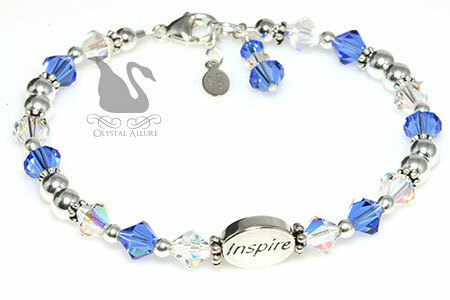 This handcrafted beaded bracelet was designed with both crystal aurora borealis (AB) and blue sapphire Swarovski Crystals, sterling silver beads, sterling silver filled beads, .925 Bali and sterling silver message bead that reads 'Inspire'. Finished with "tassel" style double crystal drop charm and signature jewelry tag. Bracelet measures 7-5/8". This bracelet can be customized with your school colors and/or sterling silver graduation charms. Contact me, for customization, prior to ordering.